The ultimate tool for sculpting, shaping and finishing, this Etaro texturizer is a must for every haircut. 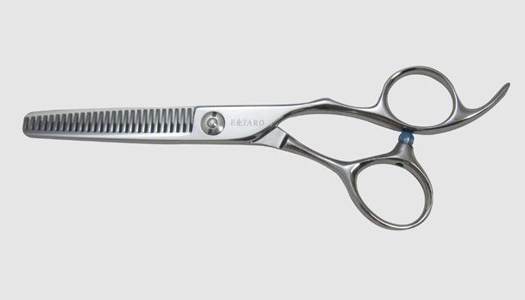 Featuring the Hikari Precision Convex Edge and super high grade Japanese steel, this texturizer cuts like the other Etaro scissors, smooth, sharp and precise. 27 teeth remove approximately 40% of the hair. Due to the large percentage of hair removal in a single stroke, this texturizer will leave a slight line of demarcation. Once you use this texturizer, you will wonder how you ever got along without it! Blade length (tip to pivot) = 2-1/4""
Overall length (tip to end of longest handle) = 5-3/4""